Rudolf “Rudi” Müller was born on 21 November 1920 at Frankfurt am Main. He joined the army and served with the Signal Corps. He transferred to the Luftwaffe in 1940 and underwent pilot training. In August 1941, Müller was transferred from Ergänzungsgruppe/JG 77, based in Rumania, to 1./JG 77 based in northern Norway. On 12 September, he claimed his first victory when he shot down a Russian I-16 fighter. In March 1942, 1./JG 77 was redesignated 6./JG 5. On 23 April, he shot down five Russian Hurricane fighters to record his 11th through 15th victories. Müller was to be particularly successful against Hurricane fighters supplied to the Russians under lend-lease by Britain. He recorded 15 victories in April, of which 12 were Hurricanes. In May, Müller claimed 13 victories, including 12 Hurricanes, to raise his victory total to 38. Some sources indicate that it was Müller who shot down and killed the Russian ace Podpolkovnik Boris Safanov (15 +14 shared victories) over the Allied supply convoy PQ-16 on 30 May. He recorded his 40th victory on 17 June when he shot down one of two Hurricane fighters he claimed that day. Feldwebel Müller was awarded the Ritterkreuz on 19 June, by which time his victory total had reached 46. He was then granted a short leave. On his return he claimed 16 victories in August, including his 50th on 4 August, yet another Hurricane, and his 60th on 25 August. 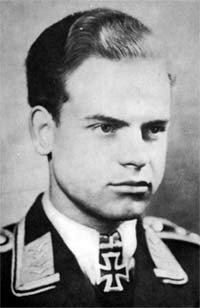 Müller’s most successful month was September, when he recorded 18 victories, including seven enemy aircraft shot down on 27 September (75-81). He shot down 6./JG 5’s 500th victory on 13 March for his 92nd, and last, victory. On 19 April 1943, Müller was obliged to make a forced-landing in his Bf 109 G-2/R6 (W.Nr. 14810) “Yellow 3” on the frozen Lake Bolschoje after aerial combat with 30-40 enemy aircraft over Murmansk. It is thought Müller was shot down by Russian ace Mladshii Leitenant Nikolai Bokii (14 +1 shared victories) of 2nd GuIAP, VVS. 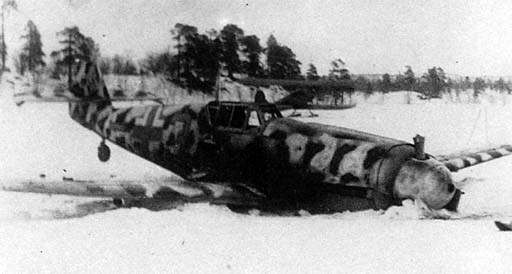 The Rudi Müller`s Bf 109 G-2/R6 after emergency landing on 19 April 1943. Note the U-2 aircraft with ski gear in the background. He was captured some hours later by a Russian ski patrol. He is said to have been seen in a prison at Murmansk in 1947 but was never repatriated to Russia. Another source indicates that Müller was shot trying to escape from a Russian prison camp in October or November 1943. “Rudi” Müller was credited with 92 victories. 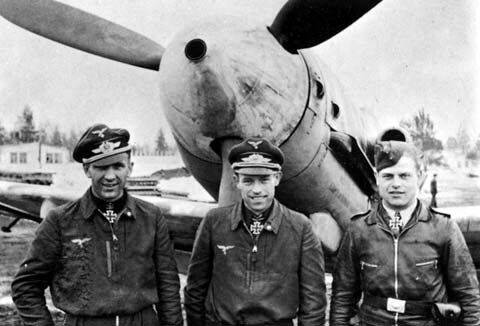 All his victories were recorded over the Eastern front and included at least 35 Hurricane fighters. - SB-2 1./JG 77 SB-3?